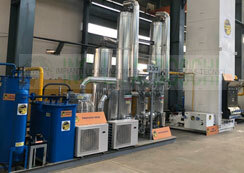 We are leading manufacturer and exporter of Oxygen/Nitrogen Plants in India. We have manufactured over 500 AIR SEPARATION PLANTS & EQUIPMENTS since 1985 in technical collaboration with ING. L & A BOSCHI, ITALY over 30 years. 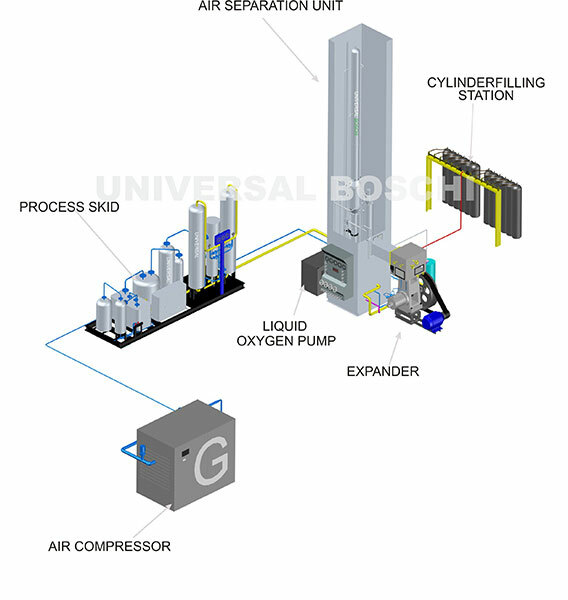 Our oxygen nitrogen gas plants come in various depending upon the requirements our customers. 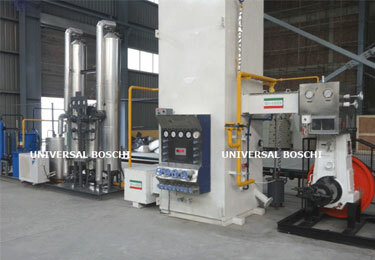 Our small capacity gas oxygen nitrogen plant offers range of 20-60 m3/hr. It is manufactured using leak-proof stainless steel column and skid mounted version for generating high purity medical and industrial oxygen. Description : The small capacity oxygen/nitrogen plants are used for filling high pressure oxygen/nitrogen gas in cylinders/bottles by liquid oxygen pump (oil free & water free) for industrial & medical applications. Simultaneous production of oxygen & nitrogen both as gas and liquid. Filling of oxygen/nitrogen by liquid oxygen pump. 100% leakproof stainless steel column. Oxygen Gas 99.7% at 155(200 opt.) bar for cylinder filling & Nitrogen gas at 0.1 bar. 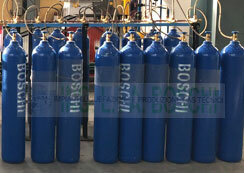 Oxygen Gas 99.7% at 155 bar and Nitrogen gas purity 99.9% (upto 99.99 or RPM opt.) at 155 bar for oxygen & nitrogen cylinder filling. Oxygen Gas 99.7% at 155(200 opt.) bar for cylinder filling & Nitrogen gas at 0.1 bar and liquid oxygen/nitrogen. Both Oxygen & Nitrogen Filling Liquid Pump. Liquid Oxygen & Liquid Nitrogen Tapping Valve. 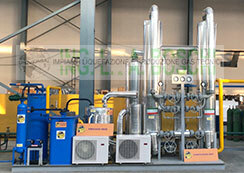 50% liquid production simultaneously with gas production by adding special chille. Our medium capacity gas oxygen nitrogen plants come with capacity of 80-170 m3/hour. We design and manufacture our plants in different capacities to meet the requirements of all types of users. The plant is fabricated using the trusted technology of ING. L. & A. Boschi, Italy. 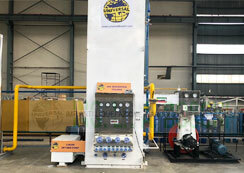 The medium capacity plant is known for its hassle-free operation and smooth performance. 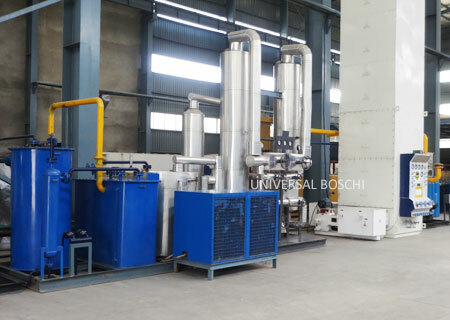 Description : Medium capacity oxygen nitrogen plant is manufactured using stainless steel column for production of high purity oxygen and nitrogen. It is used for filling high pressure oxygen/nitrogen gas in cylinders/bottles via a liquid pump for medical as well as industrial applications. Simultaneous production of oxygen and nitrogen both as gas and liquid. Filling of oxygen /nitrogen by liquid oxygen pump. 100% leak-proof stainless steel column. Oxygen gas 99.7% at 155(200 opt.) bar for cylinder filling & nitrogen gas at 0.1 bar . 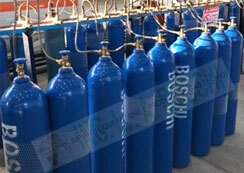 Oxygen gas 99.7% at 155 bar and nitrogen gas purity 99.9%( upto 99.99 or ppm opt.) at 155 bar for oxygen & nitrogen cylinder filling). Oxygen gas 99.7% at 155(200 opt.) 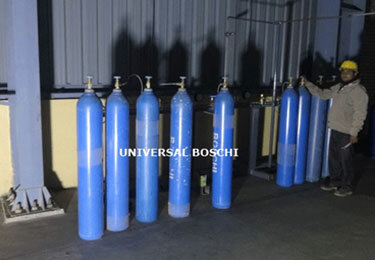 bar for cylinder filling & nitrogen gas at 0.1 bar and liquid oxygen /nitrogen. Both oxygen and nitrogen filling liquid pump. Liquid oxygen and liquid nitrogen tapping valve. 50% liqid production simultaneously with gas production by adding special chiller. We offer large capacity gas oxygen nitrogen plants with a capacity of 200-2000 m3/hour. Our plants are designed and manufactured in various sizes for different requirements of our customers. Our plants are designed and manufactured in technical collaboration with ING. L. & A. Boschi, Italy. The plant delivers trouble-free performance. 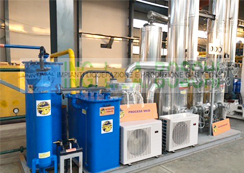 Description : Large capacity oxygen nitrogen plant is manufactures using the stainless steel column for generating high purity oxygen and nitrogen. The plant is then used for filling high pressure oxygen/nitrogen gas in cylinders/bottles through a liquid pump for applications in health care and diverse industries. Our oxygen nitrogen plants take nitrogen from the atmospheric air. The feed air goes into the molecular sieve purification system where the processed air is separated from the moisture and CO2. Thereafter, it is liquefied by cryogenic cooling with the help of latest plate and fin, high efficiency heat exchangers and expanders. Then, the liquid air gets separated into oxygen, nitrogen and various insert gases in the air separation column. Air Compressor : Rotary air compressor (screw type) is used in smaller plants with size up to 500m3/hr & 1000m3/hr. Centrifugal compressor is employed in big plants with size up to 40000 m3/hr. Air pre cooling system : Air separation plants use a chilling system in air pre-Cooling systems. Air purification system : Molecular sieve is used in the air purification system to separate the CO2 & moisture from the process air at low- Pressure. Rectification column : The unit in cold box is all low pressure technology. This unit employs the latest state of the art plate & fin exchanger, condenser and sub- coolers. The column is supplied as a packed unit complete with all the control systems including digital flow- meters, temperature, and pressure available with high purity up to 2-3 ppm nitrogen as a second product without loss in oxygen production. Expander : Expander is used for providing cooling to the air for the liquefaction process. On being braked by a booster, it diminishes the expanded air volume, stabilizes the upper columns working condition and reduces power consumption. Computer control : All the plants can be configured for automatic operation through a PC. The procedure requires out switching valves of German or Japanese and motorized cryogenic valves on cold box.